Names of residents of Sussex, with their seats, in alphabetical order of the latter and Justices of Peace for Mid- dlesex. ib. bl.uk > Online Gallery Home	> Online exhibitions	> Illuminated manuscripts	> Names of residents of Sussex, with their seats, in alphabetical order of the latter and Justices of Peace for Mid- dlesex. ib. This is a page from an atlas that belonged to William Cecil Lord Burghley, Elizabeth I’s Secretary of State. Burghley used this atlas to illustrate domestic matters. 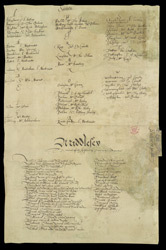 It is a list of Justices of the Peace for Middlesex, the names of individuals who act as agents of central government for a locality. A list of names of residents of Sussex, with their seats, in alphabetical order of the latter is also shown here.